We’ve all heard of the historic city of Pisa and its famous Leaning Tower, but did you know that this iconic city was also the home of the Santa Maria and the birthplace of the world-renowned astronomer Gabriel Galileo. Of course, while in the city you’ll want to pay a visit the UNESCO protected leaning bell tower, as well as the Cathedral of Santa Maria of the Assumption. Professional tour guides can walk you through the Square of Miracles and give you a detailed insight into the history of these significant structures. Alternatively, you can pick up skip the line tickets to Pisa’s top attractions and soak in the sights at your own pace. Pisa also benefits from an excellent location, just a stone throw from the Mediterranean Sea and a short drive from the beautiful Chianti Wine Region. On a full or half-day excursion you can visit the stunning Cinque Terre National Park, travel to authentic Tuscan wineries, mediaeval towns and locally owned vineyards, or pay a visit to the ‘Cradle of the Renaissance’, Florence. Regional trains connect all these locations but discovering the highlights of this particular region of Italy can also be done on a luxury coach with a recommended tour company. This is a full-day trip with will introduce you to the highlights of Tuscany, combining historical towns, scenic countryside, and local cuisine. Travel to Florence and join a full-day Tuscany sightseeing excursion. Visit the walled town of San Gimignano and tour the mediaeval city of Siena with a local guide. Stop for a delicious lunch and sample wines at an authentic wine estate in Chianti. Travellers say that, although this is a very long day, the tour is well organised, on comfortable transport, and with helpful tour guides. Comment's say that the locations visited were stunning but a bit crowded in peak season and holidays. This tour has a 4/5 star rating on Viator and 4.2/5 or Get Your Guide. Right for people who want to discover the history, cuisine, and countryside of Tuscany in one day. This tour may be challenging for people with walking difficulties. This is a full-day tour of Cinque Terre National Park and the City of Pisa. 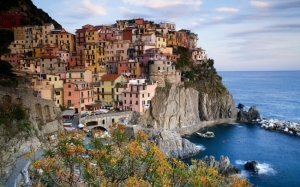 Travel by train from Florence or Pisa to La Spazia, Riomaggiore, Manarola and Vernazza. Explore picturesque seaside towns and learn about the region from a local guide. Spend 2 hours in Pisa. Entrance fee to Cinque Terre. This tour has a 4.8/5-star rating from 63 reviews on Get Your Guide and a 5/5-star rating from Viator/TripAdvisor users, with over 100 reviews. Traveller's mention that this is a long tour, particularly if you are coming from Florence, but that the tour is organized and led perfectly, with friendly guide who are fluent in English. This is for active people, nature lovers and anyone wanting to visit the Cinque Terre National Park without organizing their own transport. 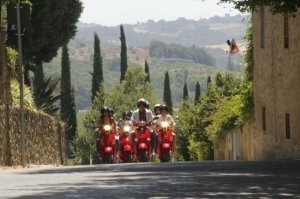 A fun full-day trip into the Tuscan country side riding an iconic Vespa scooter. A compact combination of rural sightseeing, history, and local cuisine. Take the free shuttle bus to/from Pisa and join and small convoy of Vespa scooters. Tour the Chianti wine region and visit a top winery for lunch and wine tastings. This tour has rederived 4.5/5-stars from happy Get Your Guide users who said that they 'loved the trip' and 5/5-star reviews from TripAdvisor and Viator customers who praise the English-speaking guides and enjoyed the destinations visited on the tour. This is great from motor enthusiasts and for people who want an interactive way to explore the Chianti Country side. This trip is even suitable for non-drivers who can join as passengers. 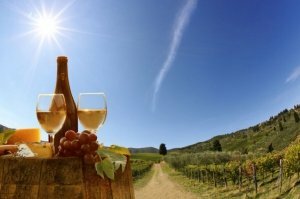 This is an opportunity to enjoy a relaxing half day execution to the Tuscan countryside where you can dip into local wine culture and learn about the wine producing process. Travel from Pisa or Lucca to a local wine estate in Chianti region. Tour the vineyard and winery with a local guide. Taste homemade wines, red and white, and sample organic virgin olive oils. While this half-day tour does not have too many reviews it still maintains a 4.7/5-star rating on Get Your Guide and an impressive 5-star rating from Viator/TripAdvisor. Comments have said that the guides are ‘amazing' and the hosts are ‘very professional'. This tour is right for people who want to taste local food and wines and see how these delicious products are produced. This tour is suitable for individuals, couples, small groups or children accompanied by parents. Leave behind the docks and travel inland to discover a couple of Italy's most iconic cities. 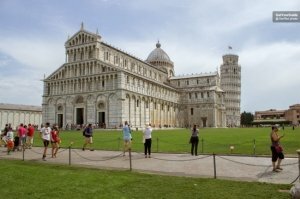 Visit the Tuscan cities of Pisa and Lucca with free time to explore each of these beautiful locations. Learn about the region from an onboards guide. Travel in a comfortable air-conditioned bus. 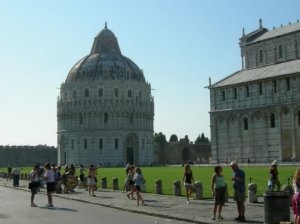 Travellers are very happy with the value for money provided by the return trip to Pisa and Lucca. Comments say that the guides are informative and helpful. This tour has a 4.6-star rating from Get Your Guide and 5-stars from TripAdvisor/Viator. 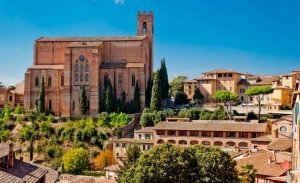 This tour is aimed at cruise ship passengers who would like to visit two of Tuscany's favourite cities. Ideal for people who want to enjoy stress-free travel. Spend a day discovering the picturesque villages which make up the Cinque Terre National Park. 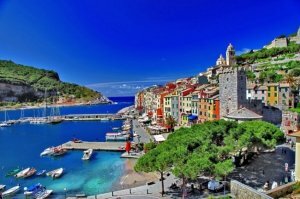 Travel from Pisa, Lucca or Livorno by luxury minivan and spend a full-day visiting the 5 picturesque fishing villages of Cinque Terre National Park. Travel stress-free in the company of an expert guide. Travellers have thoroughly recommended this tour, giving it a 5-star rating on TripAdvisor/Viator. Reviewers have been impressed by the knowledge and energy of their tour guides and the natural beauty of the park. This is perfect for small groups or individuals who want to explore the magnificent Cinque Terre National Park. This is an active tour, great for energetic people, particularly children. A small group tour walking tour of Central Pisa with the opportunity to learn about the cities past and present with a knowledgeable local guide. 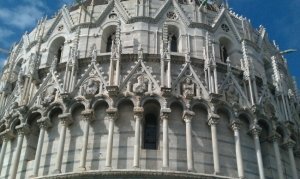 Learn about the city of Pisa whilst discovering it with your own eyes. See the Leaning Tower of Pisa, the Baptistery, the Cathedral of Saint Mary and wander through the Square of Miracles. This tour has been rated with 4.5 out of 5 stars across 3 booking platforms. Travellers talk about the ‘attentive' guides and a fun and informative tour. Ideal for people who want a quick but comprehensive introduction to the city of Pisa and it's history. Take 1.5-hours of your day to see the highlights of Pisa, admire fantastic architecture and hear the story of the famous Leaning Tower. This is an opportunity to take a guided tour of the Leaning Tower and discover the city. 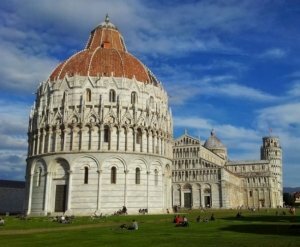 Learn about Pisa from an expert local guide and visit some of the city's major landmarks including Piazza del Duomo, the Baptistery, and the Basilica della Santa Maria Assunta. Enjoy city views from the top of the Leaning Tower of Pisa. Travellers have said that this is an interesting tour led by a knowledgeable guide and are happy that it covers most of Pisa's highlights including the leaning tower. The tour has an over all rating of 3.5/5 from Viator customers and 3.9/5 from Get Your Guide users. Comments say that sufficient time is given at each attraction. Right for people who want a ‘short and sweet' city tour and for those who want to visit the Leaning Tower without waiting in lengthy queues. An opportunity to explore the Leaning Tower of Pisa and its neighbouring Cathedral at your preferred time and pace. Bypass the long queues to visit the Leaning Tower of Pisa at your reserved time. Admire the beautiful mosaics in Santa Maria de la Assunta Cathedral. Skip the line entrance ticket to the Leaning Tower and Cathedral. Travellers have given this tour 4-5-star reviews on Get Your Guide and Tiqets.com. Travellers agree that the ticket is a huge time saver, very convenient and that the views from the tower make the visit worthwhile. This is perfect for people who want to visit the Leaning Tower and Pisa Cathedral without a guide. This ticket will suit people travelling on a low budget or will a limited time in the city. 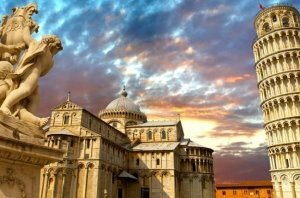 This is a unique style of walking tour which will lure you away from Pisa's top tourist sites and give you the opportunity to get a taste of this iconic city from a local perspective. Take a 2-hour walking tour of Pisa with an expert English speaking guide. Learn about all thing local and see the top spots of Pisa. Travellers have rated this city tour with 5/5 stars on TripAdvisor/Viator. Comments say that the tour is covers the main points of interest and is led by professional and entertaining guides. This is for people who want to experience Pisa from an alternative perspective, to visit the popular haunts of local residents as well as the top tourist attractions.